AMETW: Has the mobile market in Saudi Arabia peaked? Has the mobile market in Saudi Arabia peaked? Given the focus on mobile data that operators in Saudi Arabia have pinned their hopes on for future revenues, the latest data from industry regulator the Communications and Information Technology Commission seems to suggest that peak-mobile may have already occurred. 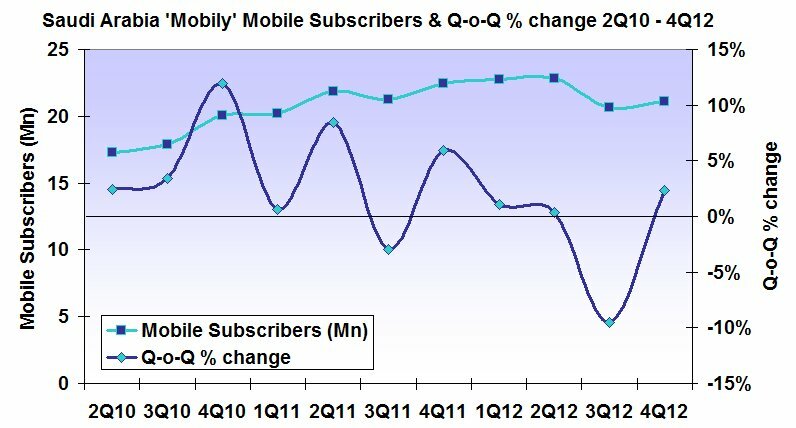 The total mobile subscriber base fell for the second consecutive quarter to reach 53.0 million, down from 54.5 million at the end of 2Q12. In fact, mobile usage actually peaked at the end of 3Q11 with 56.1 million subscribers; fell to 53.7 million in 4Q11, before rallying to 54.5 million at the end of 2Q12. CITC's data shows both pre- and post-paid totals falling, although pre-paid has faired better. The CITC data records a downward trend for quarterly change, with pre-paid seeing a healthy quarterly growth of 5 percent in the first half of 2010, and then trending downwards to reach -5.2 percent at the end of 4Q12, although there were brief rallies in 1Q11 and 1Q12: in fact, the first quarter of each of the last three years has been the best quarter of each the years, but still not enough to reverse the overall downward trend. In terms of how users are accessing the Internet using mobile sees 'Dedicated Data' entering CITC's reporting in 2Q11 with 7.4 million users, and then flat-lining for the four quarters of 2012. 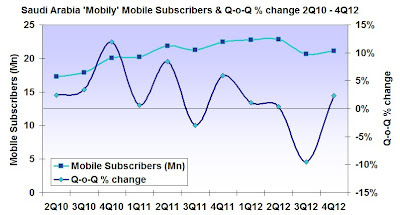 Likewise, 'Standard Mobile' access rises to a peak of 8.1 million in 2Q12, and then loses momentum in the last two quarters of 2012. Using the CITC data and market share data provided by Zain in its quarterly Investor Presentations, it is possible to plot the performance of the individual operators. This shows Mobily eventually catching STC in 4Q 2011, the two running neck-and-neck for three quarters before STC reasserts its dominance at the end of 3Q12. The rise and fall the Saudi Arabian mobile subscriber market is fully charted in 'Africa & Middle East Telecom-Week' issue dated 4 April 2013. Or for more about the Saudi Arabian mobile scene and its major players, check out the current edition of the Mobile Network Operators Directory 2013.